1. With the flat panel detector, high-quality and detailed Images of the structures of the head and neck can be generated. Adjusting the position of the FPD reduces X-ray dosage, provides higher resolution, and minimizes distortion. Optimizing collimation of the beam, depending on the size of the area, also reduces X-ray dosage and X-ray scattering. 2. Select a region of interest such as the temporal bone, paranasal sinus, jawbone or individual teeth and observe it with 80 µm voxel resolution for greater detail. 3. 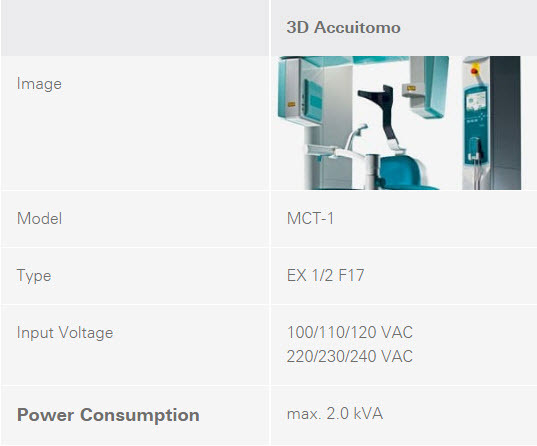 Select the voxel size 80 µm, 125 µm, 160 µm, 200 µm, or 250 µm, that best suits your diagnostic needs. (Depending on the size of the Field of View, some voxel sizes may not be possible). 4. Use the original exposure data to zoom in on critical areas using a voxel size as small as 80 µm. For a higher resolution image, a specified area can be recalculated and reconstructed using a smaller voxel size. 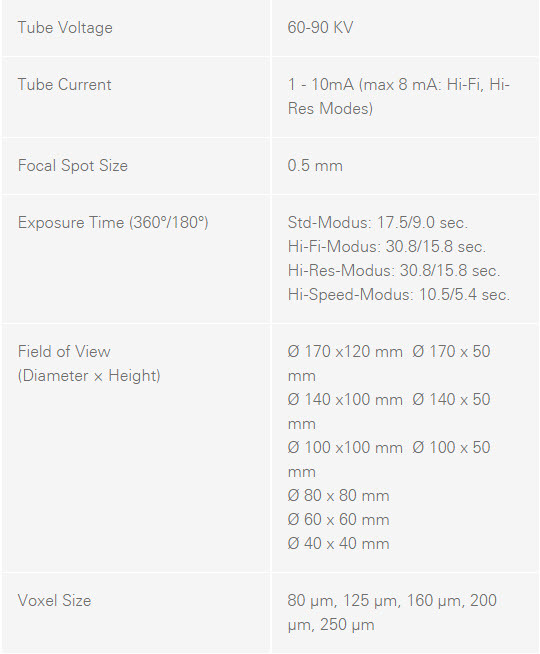 There are nine sizes for exposure regions with diameters ranging from 170 to 40 mm. Resolution stays high and distortion is minimized for all regions from the smallest (ø 40 x 40 mm) to the largest (ø 170 x 120 mm). This is the highest resolution. Exposures are made at one-fourth the size of the detector pixels for the greatest spatial resolution. Ideal for observation of delicate bone structures such as the ossicular chain. This mode has high data density data to make clearer and sharper images. This is especially good for performing zoom reconstructions. Full scan: 10.5 sec. Half scan: 5.4 sec. Reduces motion artifacts. Good for children or others with difficulty remaining motionless. Suitable for limited and wide views of temporal bone, paranasal sinus, maxilla and mandible, individual teeth etc. The scout positioning system is easy and accurate. 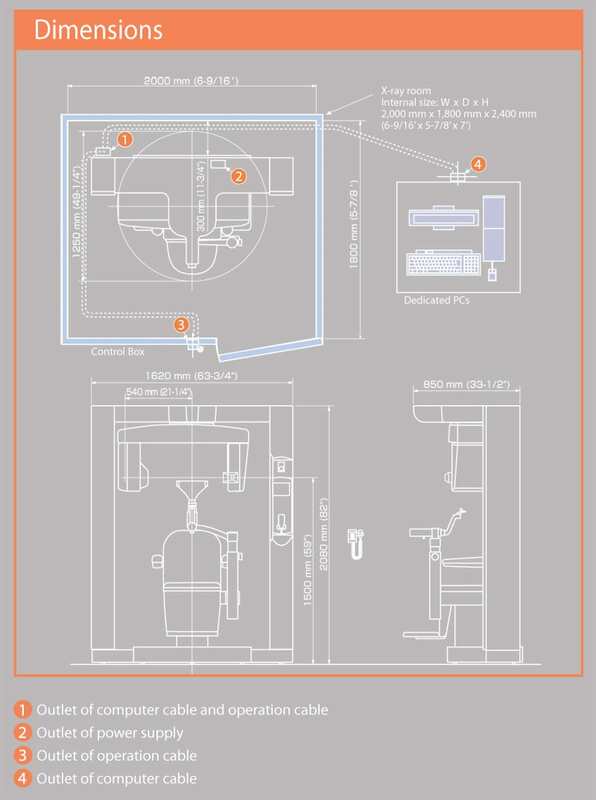 Use the triple beam positioning system for even greater precision. The region of interest can be easily targeted by making images from two directions. Then you can simply click on the images to specify the center of the region of interest. This information is transmitted to the X-ray unit, and the chair automatically moves into position. Use scout to accurately determine the minimal region of interest before exposing the patient to the higher dosage CT scan. The region of interest can be easily targeted using the three positioning laser beams. The patient’s head is safely and securely stabilized by the chinrest and headrest. Installing i-Dixel software on all intra-clinic computers enables sharing of image data on each linked client computer. Observation of images on non-network computers can be achieved with the One Data Viewer, and the One Volume Viewer without installing i-Dixel. These unique Morita applications let you view three dimentional images and volume rendered images even if the computer does not have i-Dixel software installed. CT data can be exported from the i-Dixel application and later stored on a DVD. This DVD can then be used on a computer outside the clinic to view CT images, volume rendered images and patient information. Additional functions include zoom, black and white reverse, brightness, and contrast adjustment as well as optional length and angle measurement capabilities. For more information on i-Dixel, our diagnostics software, please visit the i-Dixel webpage.